When Alzheimer’s struck my mother, I already knew its devastating effects — I’d seen her mother battle the disease. Twice, I’ve experienced the hardships that accompany long-term care. And that’s why I’m sharing my story today. I’ve seen firsthand how emotionally and financially difficult caring for a loved one can be, and I want you to know about something that can ease that burden. When I was a freshman in high school, my grandmother on my mom’s side was diagnosed with Alzheimer’s. My grandfather had passed away a few years prior to her diagnosis, so Grandma came to live with us. I watched my mother care for Grandma every day for almost two years. I often found my mother up late and sobbing. Looking back on it now, I realized she was sobbing for a few reasons. First, she was watching the mother she knew, loved and cared for slip away right before her very eyes. She was watching her mother become a shell of a person, one who didn’t recognize her, didn’t communicate with her, and could no longer share her laughter and sorrows. Secondly, she sobbed because she was alone, for the most part, in caring for her mother. It meant doing everything — getting her dressed, helping with toileting, transferring her from a bed to a chair, showering, eating, dispensing medications and more. When my grandmother eventually passed, it was hard on everyone, but it also was a blessing — Grandma was no longer suffering, and my own mother could now devote some time again to herself. Years later, after I’d married and started my own family, we started to notice changes in her. The woman who always had been voraciously independent and not scared of anything now didn’t want to venture too far from home. She began to get more and more forgetful. While she was still of sound mind, a battery of tests revealed that she was suffering from Alzheimer’s, just as her mother did years ago. Reflecting back to my high school years, I knew what was involved in being a caregiver. We knew that mom could no longer live alone, but we also knew that we couldn’t provide the type of care she needed. She moved into a beautiful assisted-living facility, and while it took some time to adjust, she fell in love with it. To help pay for the cost of the facility, we had to liquidate some of her investments, but the money quickly ran out. So we then had to sell the home I grew up in — the home she lived in for 40 years — to pay for her care. Because of how Alzheimer’s progresses, she needed more supervision and health services, which resulted in higher care costs. The money from the sale of the home ran out, too. We exhausted all of her assets, and she applied for Medicaid. Once she was Medicaid eligible, she had to move again — to a Medicaid facility, where she lived the last six months of her life. While we could not have avoided the outcome, we could have avoided many aspects of this situation. If my mother had long-term care insurance, she could have stayed in her home and had someone come to the house to help care for her. When it was time for her to move to the assisted-living facility, the policy would have paid for her care there. Finally, we would not have had to sell her house, and she wouldn’t have had to move to a Medicaid facility to receive care. Unfortunately, neither my grandmother nor my mother had long-term care insurance. I’ve worked in the insurance industry for nearly two decades, but it was my personal experience with caregiving that convinced me of the value of long-term care insurance. You cannot prevent the heartbreak of a disease like Alzheimer’s, but long-term care insurance can ease some of the emotional burden by taking care of some of the financial needs. I am proud to announce that Medicare MarketPlace® can now help you and your friends and family with long-term care solutions. 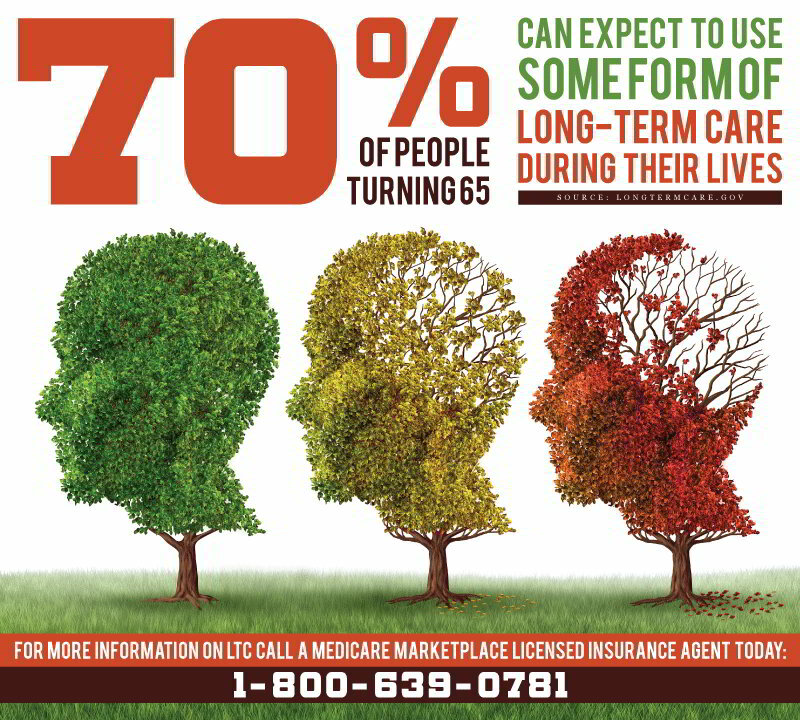 If you would like to discuss your long-term care concerns and explore if long-term care insurance could help, call Medicare MarketPlace at 1-800-639-0781 and ask for Shelly.